That’s what you’re craving for, right? After all, you can’t build a business using your blog without traffic. And you were told to guest post to get traffic. Jon Morrow did it, and he built a successful business. Danny Iny did it. Even in the old days, Brian Clark did it on Problogger to promote his blog. And you try it, and then you get 10 subscribers per guest post, or 25 subscribers on a good one. 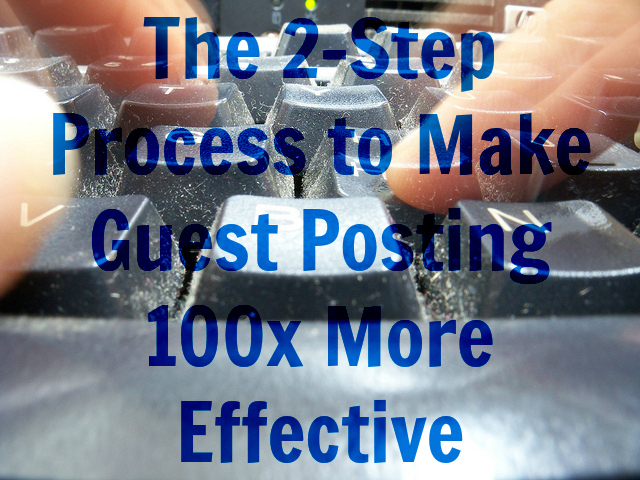 Guest posting is one of the strategies that has worked for a lot of people to build their business. That’s why more people are guest posting. In the old days, all you need was publish a post and you’ll get a 300-400 subscribers if not more, if the post is placed on popular blogs. Jon Morrow was able to get 1000 subscribers from this post in only after a month, Twentysomething: Why I regret getting straight A’s in college. Danny Iny was able to get 1200 visitors on the day this post was published, 38 Critical Books Every Blogger Needs to Read. These are the kind of results you’re looking for, right? Guest posting has been nearly saturated, and yet more bloggers are doing it. Yet, bloggers like Bryan Harris was able to get 503 subscribers from one post. If you want to get the same results as Jon Morrow and Danny Iny did, nowadays, you should do more effort on your guest post. That’s how Bryan Harris was able to get his 503 subscribers from one post. I’m talking exactly about the three-part formula to getting more attention. That’s how you could be a blogger that people pay attention to. You should leverage your post more to get more subscribers. Give next-level content, aka content upgrade. You should promote the hell out of it. A lot of bloggers are guest posting on the same site. Use blogger outreach to promote your post. So how to apply each of these? That’s what this post is for, so continue reading. You need to give next-level content for the post you have published to get more subscribers. You need to have a bribe to get them to check your site that is related to the topic of the post. You can’t do it with any bribe, as in the old days. Specifically, I’m talking about content upgrades. Maybe, you’re familiar with content upgrades. You may have seen it on Bryan’s Video fruit blog, or on Brian Dean of Backlinko. 1. Offer more tips on how people could do what you shared in the post. Here is an example from Noah Kogan’s blog by Paul Shapiro, We Analyzed the 3,000 Most Successful LinkedIn Publishing Posts. 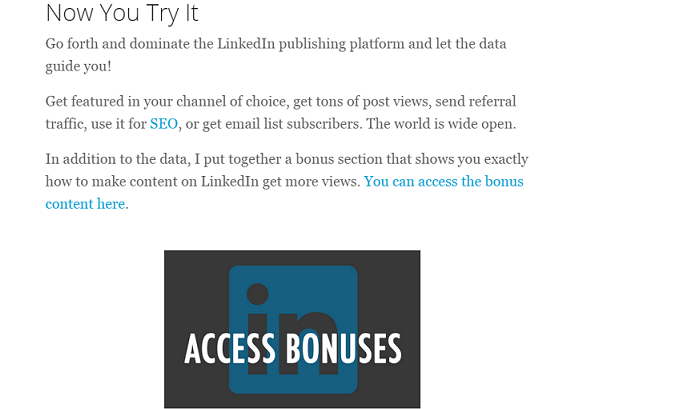 Paul shared more tips on how to get more views from Linkedin for people who subscribe. 1. Create a new page on your blog and write these tips/create a pdf. 2. 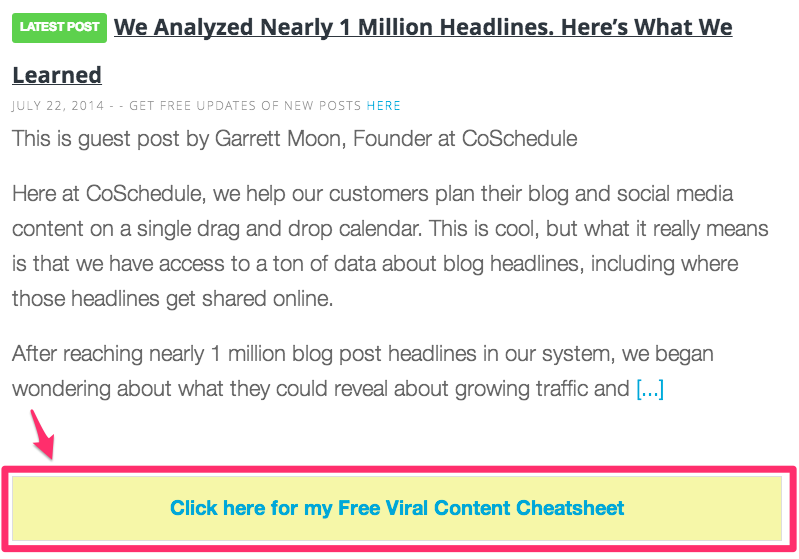 Use leadpages to create a lead box for people to subscribe when they click on the link in your post. Set it to redirect to the page you created in the previous step. Or, if you don’t want to use leadpages, create another page that prompts people to subscribe to your blog, place a form there, and link to this page from the post. Yes, you could just create a pdf of the post, for people to read whenever they want. Simple, right? Jenna Dalton submitted a great post for Boost Blog Traffic titled, The Ultimate List-Builder’s Resource Guide: 111 Links to Double or Even Triple Your Subscribers. At the end, she created a bribe for people to subscribe and get a pdf of the post. Brilliant, right? A lot of great resources were shared in this post, and you’d like to check them as you go after that. A simple strategy you could also use is creating a video showing people how to exactly do something. There is nothing better than observing what others do. It’s also received as a higher value, so you’ll get a higher percentage of people sharing their email address with you to get that video, especially, if it’s a tech video. Yes, it won’t work with all posts, but when you can do it, I encourage you to do it. 1. Have a list of the steps you need to take and notes if you need to. 2. If the topic is related to tech or online thing, you could record your screen using Camtasia Studio. If it’s an offline thing, open the camera and record. 3. Don’t re do the video, if you have something wrong, wait for seconds repeat the part you said wrong and continue. 4. Cut the parts you didn’t do well and produce the video. You could use Camtasia also. 5. Upload it to Youtube, Wistia or Vimeo. Take your pick. 6. Create a new page and add that video to it. 7. Link to either a new page that asks people to subscribe with a form, or to a leadbox. You could also talk about it at the end of the post, as Bryan’s post. But if you can’t, don’t panic. Sharing it in the bio is enough to make you more than 25 subscribers that you used to get on big blogs before. Jenna did that in her guest post on Boost Blog Traffic, and I’m sure she had great results. Now, you need to spend more time promoting the post after it’s published. Yes, the post is published on big blog, and that blog gets a lot of traffic, but you need to stand out. You’ve done the hard work already. A tweet from one influential in your industry could send you additional 50+ subscribers. The best part, the owner of the site will notice your work, and this will help you build relationship with him faster. So how to promote your guest post? Yes, you could tweet it. You could share it on Facebook and on Google+. But that’s not how you get big eyes on your post. The only strategy I know that is effective to get big bloggers to see your post is to reach out to them and tell them about it. Other than that, you’re in luck if they see your post. 1. Search for posts similar to yours on Google. 2. Check for people who linked to these posts using Open Site Explorer. 3. Check for those who tweeted the post using Topsy. Click on the influential only tab, to save you time. 4. Email them and tell them you liked that post and why your post is better. Be brief. 5. Find similar content on the blog and repeat step 2+3. 6. Don’t forget The Howdy Neighbor Technique. Email people you mentioned in your post. They’ll be honored that you mentioned them on big blogs. They’ll be proud of it, and they’ll thank you for it. 7. Be creative, and find more people to email. Here is how I could apply Blog Outreach for this post. It’s better to learn from observing what others do. Here’s what I could do to promote this post. 1. Check for content about guest posting. 2. Plug the sites I find on Open Site Explorer and on Topsy. 4. Find people who linked to the “How to be a blogger people pay attention to” post and “The Howdy Neighbor Technique” post. 5. Email those people also. 6. Email people whom I mentioned in this post like Jon Morrow, Danny Iny and so on. They’ll be happy to share it. Now, you know what it takes to get more subscribers from your post. You also know how to stand out from the rest who guest post on the same blog, and get to build relationship with the owner of the site faster. All you need now is to take action. Nothing would happen if you move on and don’t do anything. Yes, you won’t get 500+ subscribers the next post, but you could get 100+ subscribers if you choose the right blog and apply what I shared with you today. You can get more subscribers. The sky is the limit. Just take action. Flickr Creative Commons Images via Kiran Foster (adapted). By night, Ahmed Safwan is busy “figuring out how to make blogging simpler, not easier” over at Smart Marketing Boost. By day, he studies to be a dentist. Don’t leave without snagging your free videos on the 3 types of blogs posts that goes viral and the only promotion strategy you need to follow to make sure that your next guest post goes viral. It’s great that you made it on my article. Congratulations!!! Hope to hear what do you think about it. You finally did it, Jaime! Okay—SO sorry about the wait, Ahmed! The article was fantastic. Clear, clean info–yes–but I’m struggling to see how I can apply it to myself now. It’s not you, Ahmed, ….it’s me. Okay…. (pushes jelly into corner of mouth), I’m good. SOOooo this is about after we have actually found a guest post gig. Which I seem to be struggling with of late—because now I’ve ditched all the adults and gone back to kiddieland (good thing)…and no longer have the same circles to write for. See, that’s the problem–THERE ARE NO PLACES FOR A BLOGGER TO HANG OUT TO MIX WITH YOUTH/POTENTIAL YOUTH READERS. Now that i have all this sob crap outta my system, let’s take this from a POSITIVE view, shall we? Cause this is brilliant information–and I want to discover a way to make it work for me. How can I achieve success on my own site IF I can’t guest blog. #1 Create epic content for readers. Yeah, I know this SHOULD go without saying, but I wonder if the trick here isn’t just creating the content…but in creating “reference/resource” content. Info SO good and SO specific and SO MUCH of it—readers will tab it and refer to it as an ongoing resource. From what I’ve seen, things like that get shared. A lot. #2 Create a never-before-done treat for those who sign up for the mailing list. Not sure how yet–but I know that this is critical–which is why I can’t agree with you more, Ahmed, when you said we can’t just get by with what used to work. People are also going to remember you if you deliver less-than-brilliant content/offerings. #3 Content Upgrades Are The Key. I got this incredible plugin called WP Sharely that I have become addicted to. It allows you to hide content right on your page that cannot be revealed unless the person does a social share to Twitter, Likes a FB page or gives a G+. It’s amazing and if used right, could potentially create a share loop with the right information. The rest—like promotion? Well, I’m still working on that. Parents are a dead end when it comes to youth fantasy writers like me. HOWEVER, getting a “SnapChat” account sure has helped. …as soon as I did, it connected me with my 17 year old son in the next room! So now he’s teaching me AND helping me promote my website. There MAY BE HOPE FOR ME! But then again, you always were a clever guy. It’s called the “Devon Principle”….silent, but brilliant. Who said you can’t connect with young people? You don’t need to guest post on sites on your same topic. You may find an intersection between your topic and other topics and come up with great idea that fits both. You’re not targeting topics, you’re targeting audience. But I think you should create the optin bribe first. Thanks for this long comment. Oh, I’ve guest posted—many times, Ahmed. Maybe I didn’t explain. I haven’t found places where kids (of my target age) are. Oh, plenty of parenting sites….but when was the last time a teen actually wanted to read something their PARENTS suggested? But that was the route I went. Also, I’ve blogged on business sites, technical sites…I’ve even blogged here, for Kevin. Nooooot too many kids around in these parts, nor do the adults (or even parents) spread the word to kids they know….so it really is back to my original issue, and that is, there aren’t any…and I stress here–“ANY” popular youth blogs to go after. So the game has to be played differently for me. That’s all. I’ll get it. No doubts. Welcome on the long comment. It’s what I do. Thanks for mentioning my post, Ahmed! (And for saying my idea to have a PDF of the links as the opt-in was “brilliant”. I’ll have to tell my mom someone called me brilliant 😉 ). You share some great ideas in here and I definitely agree – guest blogging is not dead, but it won’t get you the subscribers it used to unless you know how to play the game now that it’s changed. Oh, and in case you’re curious, that Boost Blog Traffic post sent me 116 new lovely subscribers and counting. It’s glad that you stopped by and commented on my post here. And you got 116 subscribers… I wasn’t wrong when I said that you were brilliant. I think if you had hinted to the bonus in the content and shared it in the conclusion, you would have doubled that number. BTW, I was one of those 116 subscribers. Waiting for your awesome emails. I remember reading your BBT post Ahmed mentioned. You did a great job! Very thorough list you gathered, and the free PDF (plus checklist) was an awesome bonus. No surprise at all it earned you 116 (and counting) new subscribers. Appreciate you stopping by and commenting on Ahmed’s excellent post. I’m sure he appreciates it, too. Hope to see you around here again! Thank you, Kevin and Ahmed! You’re right Ahmed – mentioning the PDF in the post probably would have drawn even more subscribers. Always things to improve on, right? Or else we’ll just get stagnant. Thanks for the welcome, Kevin. I’m sure I’ll be around these parts again! Interesting an potentially useful. And I know what you mean – I know existentially – when you say that guest blogging is not what it used to be. I’ve done a fair share of that and nothing much happened for some time. Reading your post I know exactly why. Thanks! Thanks for commenting, and welcome to the blog! Hope you are having a great start to your week, Maria. Hope to see you here again. Guest posting has become more saturated, but it’s still not fully saturated. You still have the opportunity to benefit from it. Just apply the above 2 techniques and you’re good to go. Hope to hear your results. This is perfect timing for me Ahmed! I’ve been wanting to start doing some guest posting, actually been wanting to do it for a while just haven’t had the time to focus on it. The reason I’m so eager to get going on this, is to try and give my email list a kick in the pants. So, this post is perfect. Not only did you give me a better understanding of some things I can do with guest posting, but you also gave me a great idea for leveraging a content upgrade for a post I’m currently creating for my blog. Great meeting you over here Ahmed! BTW – Thanks for hosting this great topic on your blog Kevin. ahh, I stumbled on this at the right time. I have a few guest posts lined up and this information really helps. It a smart idea a way for the traffic of that blog to subscribe to your blog. Thanks for the share Ahmed! Have a good one! I also used leadpages for one month and then I cancelled my membership. I’m glad that this post was on the right time. Great post. I’ve bee guest posting more and more and you’re right. It’s not like how it was back then, even though I wasn’t blogging back then. I know it’s just not the same. Thing is, you DO have to do more. Much more. And implementing things like the Content Upgrade can certainly help. However, I had a few guest posts where I wrote in my byline a content upgrade offer, etc. and the author removed the link. So, I there were a few posts that I wasn’t able to get much subscribers from because it didn’t go to the special offer I had for them. So, with that, I’m asking each person I guest post for now, if they allow that on there … or if they only want my website. Because it makes no sense wasting all that time on an upgrade specific to the post if the author is not even going to keep the link. Great post regardless. And I learned some new things here. I enjoyed reading your post. I am a strong believer in guest posting. I do agree with you that it is quite saturated by now. It is still worthwhile I think. Great article, Guest posting always is good strategies, with Guest posts you will build relationships with new people, Establish Authority and improve rank with search engines. With Ahmed’s tips surely you will get more visitor. Excellent Post, Content upgrades paly a vital role to make guest posting more effective. Offering PDF is a great idea. I heard about this at Brian Blog. He implemented this to most of his post. Effective guest posting can help us to get many subscribers but it is only possible with content upgrades. I also implement this into my next guest post to take it next level. I think the best to promote any article is if one can convert that into a document or a pdf or a slide. Then one can spread about that document in various platforms which in long run generate a huge traffic from various sources. Hey Ahmed! 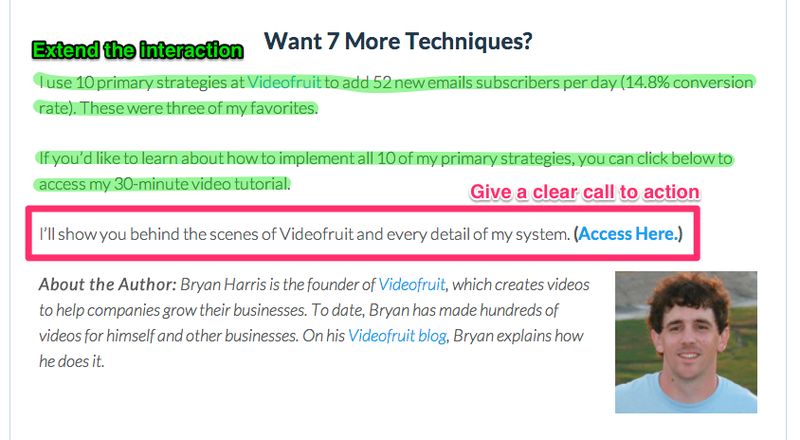 I enjoyed this post, especially the tip for creating videos quickly. I think the best way to drive more traffic to your blog by writing guest posts is by choosing carefully the blogs you choose to write for. One way you can do this is to study the blogs you want to write for to see which posts are the most popular (what topics do they cover, etc.). This includes which posts have the most comments on them, especially comments asking questions, or saying how “timely” is for them, or “really useful” to them. This gives you insight into what they want to know more about. There’s a clue for a guest post to pitch the blog’s owner. It also gives you a clue for creating a popular Content Update. Thanks @Kevin for introducing me to Ahmed. My favorite idea is the content upgrade. I do have a question though, how much do you hold back for the upgrade? Is it like the Ramit Sethi rule where you really are holding back maybe 2% of your content? is it an upgrade that is more like a companion. I’ve found some success personally creating a how to guide or a supplemental guide (like an excel spread sheet) that helps them accomplish what I was teaching them in the actual guest post. Have you found anything like that to work? Yes, even from bigger blogs – getting more than 100+ subscribers on a guest post that did well, is difficult. I like the tips that you have mentioned. One has to promote their guest posts, but that won’t take it far – however, if your guest post is on a decent A-list blog, promoting it is easier. Neil Patel suggests that we should link to as many sites as we can from a guest post – and that is a good idea because you can ask those people via outreach and request a share. Generally, even without linking – other popular influencers do take notice of blog posts published on stronger blog and they share them.